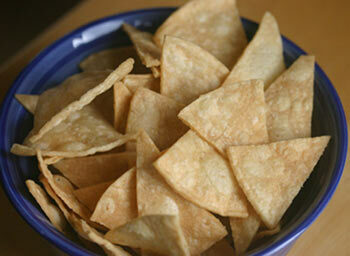 Homemade tortilla chips are easy to make if you know a few key pointers when you are making them. Yes I’m going to deep fry them. Deep frying is a no no these days but some things just have to be done this way and making homemade tortilla chips is one of them. Okay, so we are not going to eat these every day. Deep fried anything is not good when you do it too often but I felt you needed to know how to make these the proper way. You can indulge once in a while, other wise you run the risk of getting cranky. I’m a big fan of eating healthy but I’m also a big fan of balance. I like the 80/20 rule. Eat healthy 80 percent of the time and go crazy and satisfy a craving or two the other 20%. When I’m doing my 20%, I sometimes eat delicious homemade deep-fried chips. It puts a smile on my face because they taste so good. They are light and crispy with a hint of salt. I love dipping them in homemade refried beans, salsa or guacamole. It’s all about the oil’s cooking temperature. If you have a deep fryer, by all means, use it. It will regulate the temperature of the oil for you. The result will be beautifully cooked chips. I’m going to be making these chips without a deep fryer. In which case, you will need a smallish frying pan, say 10 inches. The bigger the pan, the more oil you are going to use. You need to think in terms of what you are going to do with all that oil once your are finished. It’s just a consideration. The next most important tool you will need is a candy thermometer with a clip. This will tell you what temperature you are at. Adjust the temperature up and down as needed. Clip it on the edge of the frying pan. Try to have the tip suspended in the oil and not touching the side of the pan. When you cut your tortillas into your desired shape, sometimes the tortillas stick together. Either shake them apart or break up the clumps of tortillas with your fingers. If they stay clumped together in the oil they don’t cook properly and become chewy. Salt and or season the chips pretty quickly after they come out of the oil. Drain a bit and then lightly salt the chips. This will ensure the salt sticks to the chips. Let’s talk a bit about safety. The deep fryer will be safer to use than the frying pan method. Why? Because with the pan method you have more of a chance of spilling the oil on the stove with that flame underneath. Don’t leave the hot pan of oil unattended under any circumstances. Oil gets hot fast. When you fill the pan with oil leave 1 inch or more from the top of the pan. The chips will bubble up when you add them to the hot oil. Refer to my video making homemade tortilla chips. Only add and cook a handful of chips at a time. This will minimize the boil over potential and keep the oil temperature more even. Remember the more chips you add, the more oil they displace which means you are more likely to spill oil out of the pan. If you did (heaven forbid) have a flare up, don’t throw water or anything liquid on the flames. The first thing to try would be a lid, preferably not glass. You could try baking soda but it takes quite a bit. Call 911 if it gets out of hand. In any case, my disclaimer is that you are cooking at your own risk. Pour enough oil in a 10 inch frying pan so that you have about 1 1/2 inches deep of oil. Leave a good 1 inch of space or more between the top of the oil and the top of the pan. Attach your candy thermometer to the pan and heat until the temperature reads 350 degrees F.
While you are waiting for the oil to get to the right temperature, cut the tortillas into eight’s like a pizza. You can also cut them into any old shape your heart desires. Separate the tortilla pieces with your fingers to make sure none are sticking together. Head over to the frying pan and add a handful of tortillas gently to the hot 350 degree oil. Using tongs, turn over the chips carefully so as to not spill any oil. Continually turn the chips over while they cook. Continue to cook until the chips pretty much stop bubbling up. Use tongs to remove chips, giving them a moment to drain into the pan before placing on a paper towel covered cookie sheet. Once all the chips are out of the pan, sprinkle salt and any seasoning you desire. This will ensure the salt and spices stick to the chips. Enjoy! 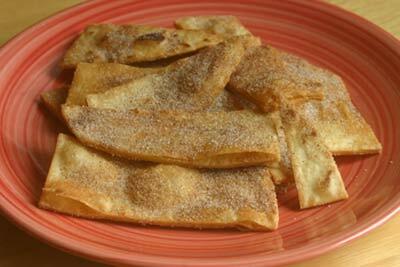 There really is no difference in making cinnamon sugar chips compared to the homemade tortilla chips recipe. The technique is the same. Same oil, same cooking temperature. The only difference is you will use flour tortillas instead of corn. You will also use cinnamon and sugar. In my video I used a ratio of 1/3 cup sugar to 1 tsp. cinnamon. You can vary these proportions to suit your taste. Be sure to season these chips soon after taking them out of the oil. Once all your chips have cooled completely, store them in a ziplock bag. They should keep several days. To get that “just made” taste, place a bowl of chips in the microwave for about 30 seconds and everyone will think you just made them. I hope you enjoyed our homemade tortilla chips recipe. Now go make some and have fun. Be safe. Click here to watch my Corn Tortilla Chips video.